With two weeks left of my “summer vacation” I felt the need to do some diving in New England. On Saturday I went down to Atlantic Aquasport’s weekly shore dive event. 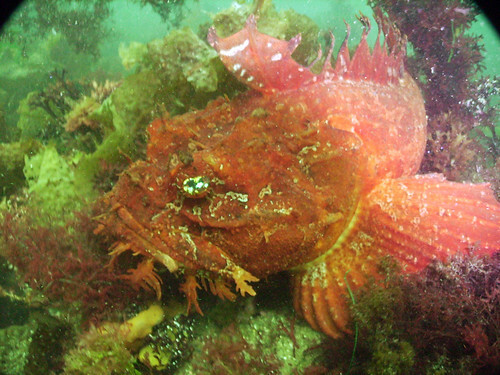 The dive site of the week was Nubble Lighthouse in York, Maine. It was quite an adjustment after coming back from the clear warm water of the Caribbean. Chris was the divemaster and did an excellent job navigating our route. 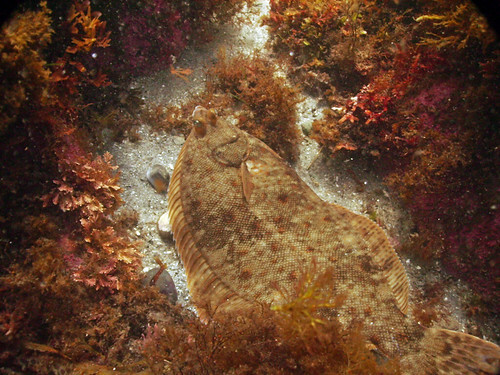 I spotted this flounder(above) during the swim across the channel. Both eyes on the right side of the fish tells me it is a Winter Flounder. We went northeast along the island before heading west into the cove beside the entry spot. The cove is full enormous rocks and ledges covered in marine algae. It is a good habitat to see crabs, lobster and starfish. This is also a good area to see stripers and other fish. I noticed lots of lost fishing lures and broken line. We saw two good sized Sea Ravens, one of which is pictured above. Nubble is also a good place to see starfish. I was hoping for a shot of a group of starfish of varying colors but I was out of luck. 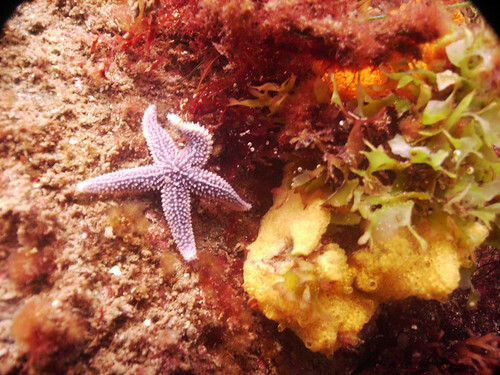 I did get a nice close of of a Northern Sea Star and a Blood Star (not shown). Next to the starfish is some crumbs of bread spong below some irish moss. 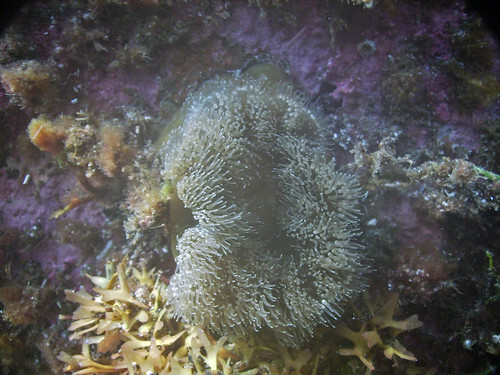 I think the photo above is a small Frilled Anemone. I found it in shallow water on my way back to shore. Last Sunday I did my longest Rail Trail trek to date. I rode from Lebanon out to Tewksbury Pond in Grafton, NH. I estimate it was a 40 mile round trip. 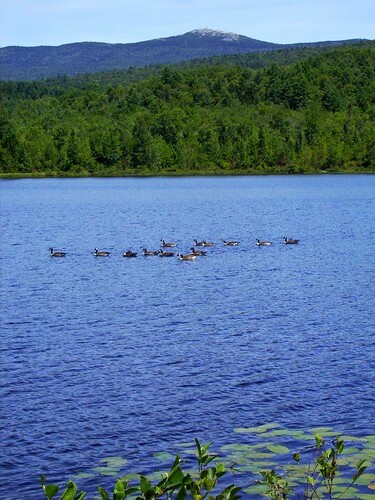 Along the way I was lucky enough to get a photo of some geese in Mirror Lake with Mt. Cartigan in the background. I finally made it down to Bonaire and got some pretty good photos. The trip had many ups and downs. It started like the vacation from hell but the managers at Divi Famingo made sincere efforts to help me resolve my issues. Divi Flamingo resort has a top notch photo shop on the property named Capture Photo. They carry a wide selection of Sea & Sea underwater cameras for rent and sale. They will download all your photos after your dive and burn them to a CD before you go home. A one-hour photography class with one of their instructors allowed me to return home with the best underwater photos that I had ever taken. The best surprise was the chance to buy a DVD of Tuesday’s boat dive taken by Capture Photo’s talented wildlife photographer and videographer, Christine Humphreys. There is no better way to share your dive vacation with friends and family back home than showing them a video. Tuesday evening was a blast. I went down to City Cafe and happen to run into the crew from Capture Photo. They are an “international” group that had traveled a lot. The conversation was stimulating and the beer fantastic. By the way, the beer on Bonaire is fantastic. You won’t see Corona for sale, but they do have Heineken, Amstel and an Amstel product called Bright, which you drink with a wedge of lime. There is also a local pilsner from Aruba called Balashi, which I enjoyed very much. All the beer had an alcohol content of 5%. It’s not easy to go back to drinking US beer. The night dive with Christine and James was a blast. It was my first opportunity to make a night dive since I was certified. We went to a dive site named Something Special at the north end of Kralenijk. After crossing sand flat, we turned north and swam along a steep slope. We also found an underwater Webcam that we think is one of the “Yellow Submarine” cams. However, I can’t find it online. Marine life of note on the dive was a free swimming spotted moray, two coral crabs, several parrotfish that were asleep, coral with the polyps open, two red sponge brittle stars on some purple tube sponges and several giant anemones. I met some great people among the other guest during the week. I enjoyed talking with Paul and Richard during the boat dives and at a few meals. Scott and Sherri is a couple from Colorado that I talked with a lot. We had a great time snorkeling then drinking on Saturday. They gave me some great ski travel tips for Colorado.